A daily programme broadcasting on Radio Beijing in every 10:00 pm- 10:30pm, which tells story of Chinese people, food and interesting places. 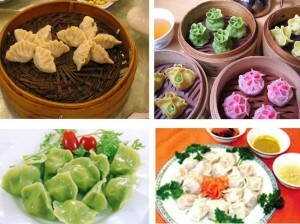 These two clips are two of them, broadcasting on 2008, telling the culture of Chinese dumpling. Dumplings are cooked balls of dough. They are based on flour, potatoes, bread or matzoh meal, and may include meat, fish, or sweets. They may be cooked by boiling, steaming, simmering, frying, or baking. Ingredients may be as a part of a filling, or mixed throughout the dumpling. Dumplings may be sweet, spicy or savoury. They may be eaten alone, in soup, with gravy, or in many other presentations.